-On September 15, 1928, Scottish bacteriologist Alexander Fleming discovered penicillin while studying influenza. -And on September 15, 1821, Costa Rica, El Salvador, Guatemala, Honduras & Nicaragua declared their independence from the Spanish Empire. (we can’t forget they also celebrate as well). Yes! September 15 is Costa Rican Independence Day. And that is the important historical event I would like to explore on this blog. It seems to me that every year I enjoy this independence day holiday in a different way. When I was in school, it was a day off … love it! Then, when I was in high school, it was a day that I had to participate in parades to get extra points on my grades … not so much love! Later, when I was in college, it involved a lot of questioning about the facts of the conquest (with respect to my Spanish friends) … I didn’t love realizing some negative facts behind Costa Rica’s history! After I started working in tourism, I also started enjoying Costa Rica Independence Day more because I have learned so much in order to explain it. I can love and accept the good and the bad around what makes Costa Rica a free nation. This year, 2017, since I work in an NGO with children, it’s been fun to see them practicing for hours to prepare songs, making lanterns from recycling materials (proud of them!) and also creating all the decorations! 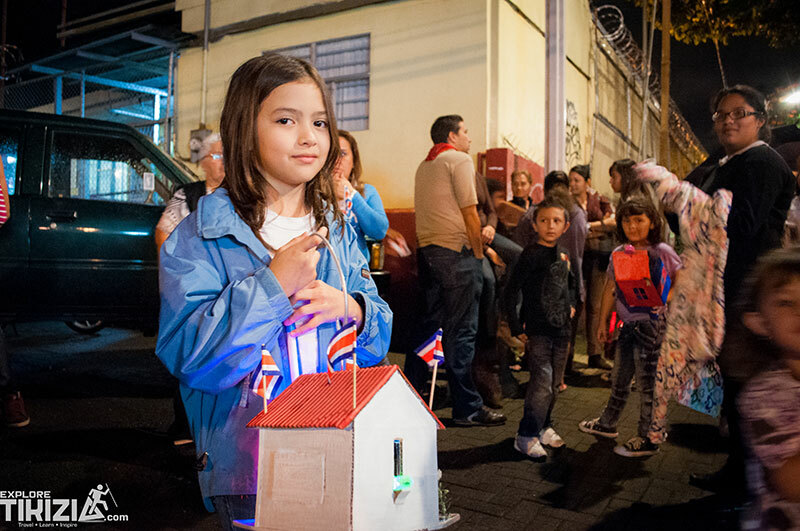 School children play an important role in Costa Rica’s Independence Day celebrations. People say that the future of the country’s freedom lies in the hands of the young people. The torch: Students from all the schools around the country do the traditional run with the torch. This represents when Central America got the news of the independence—the news came with people on horses carrying torches. Lanterns: Guatemala had lanterns when they got the news. Costa Rica celebrates by gathering outside, representing the crowd waiting for the news. At 6:00 pm, they sing the National Anthem and the children with the lanterns do a loop in town. Parades: Children also parade with flags on the day of the 15th, and singing patriotic hymns. Costa Ricans have always celebrated the fact that their patriotic parties are an activity of school children, not military groups. Interestingly, Costa Rica did not know of its independence until October of 1821, because in those days, it took a month for the news of independence to arrive from Guatemala. I would like also to share the perspective from our friend from the United States who lives in Costa Rica and has experienced this tradition. We found each country celebrated differently, and it is interesting to see the context of each celebration. I really loved attending the Costa Rican Independence Day parades last year (2016). In arriving into the downtown area, the excitement is contagious. The whole town comes together to watch the students represent their schools and parade through town with the Costa Rican flag. Many of the schools also have a band with drums and lyres, which plays a mix of national anthems and popular songs that everyone recognizes. Students dress in typical Costa Rican attire and dance to traditional songs. People stand on all sides of the road with their Costa Rican soccer jerseys on and flags in hand. In San Ramon, everyone knows one another, so it’s fun to see the kids waving to friends and neighbors as they walk by. It reminds me a lot of Independence Day in the States, but one that takes place in a very small town. The September 15th parades are a wonderful example of the youth recognizing the traditions of the country. I highly suggest attending the parades if possible to see what it’s like! Drums instead of arms since 1948! Thank you, I give my good father. where, in peace, I feel full. You didn’t enjoy participating in parades for extra credit!?!?!? It seems you’ve come around more to the celebration of Costa Rican Independence these days, though. Hi, Trevor! Yes, I did but they only give you credit when you are in high school so in elementary school was a torture walking in a tropical humid weather, sweating and carrying an instrument that was bigger than you under the sun WITHOUT credit imagine! Yes, I do now! I’m always fascinated by culture and history so I really appreciate this post and learning about the ways that Independence Day is celebrated. I love parades so maybe one day I’ll get to be in Costa Rica on 9/15 to see one! Yes, that will be nice just let us know we will be happy to show you around! Another historical fact is we don´t have army since 1948 so now the teachers and the kids filled the streets during independence day!Thanks for reading! I love this post. It’s so real and authentic. It’s precisely the sort of article I look for when I look for stories from first hand reporters. It’s so incredibly cool that you, not only can write this story, but you have lived it. Thank you. Thank you for such a nice comment. I feel honor with it! I enjoy living our cultural heritage. Hope that you can come to Costa Rica one day during 9/15! Thanks for reading! Thanks for sharing this. I haven’t been to Costa Rica yet, but it’s a country I’d love to visit. It seems like it would be a lot of fun to visit on Costa Rica’s Independence Day. Yes, will be awesome that you can come. We can show around! Thanks for reading! Felicidades a los Ticos en su independencia! I didn’t know about the lanterns, what a beautiful tradition. The photos of the children are lovely. Muchas gracias Jessica! Thanks for your comment! Love the Spanglish it sounds like me!